By making it personal, both Kim Jong Un and Donald Trump are boxing themselves in. 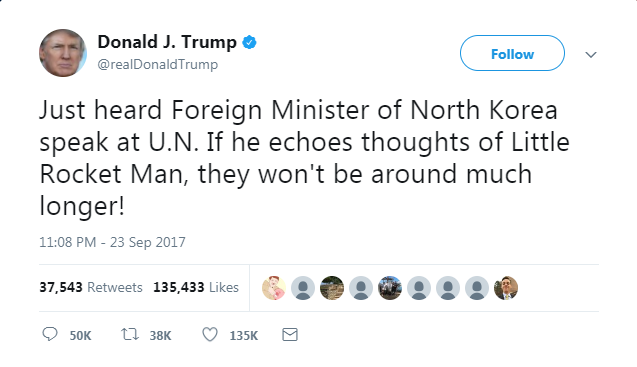 At the UN General Assembly on September 19, US President Donald Trump said “Rocket Man is on a suicide mission for himself and his regime,” referring to North Korean leader Kim Jong Un. Kim responded with a highly unusual, personally written front page editorial in Rodong Shinmun, calling Trump a “dotard,” among other things. Trump then amended his insult to “Little Rocket Man” in a tweet following DPRK Foreign Minister Ri Yong Ho’s UN General Assembly address. Aside from the confusing signals he’s sending to Pyongyang by undermining the credibility of negotiators, the escalation towards personal insults carries several real downsides. First, he’s clearly upset Kim Jong Un, potentially clouding decision-making in the ongoing crisis. Second, in a system where the “dignity” of the state is prize above all else and conflated with reverence for the leader, policy-making elites around Kim will find it harder to advocate for discussions or compromise as long as the symbolic and practical heart of their country is being insulted. Ordinary citizens will have to be seen rallying around their leader, also. North Korean media regularly criticizes those who insult the “dignity of the DPRK.” Vague denouncements against media or foreign individuals are so frequent it is almost comical. The issue of North Korea’s self-perceived dignity is less funny in some cases, such as in August when a DPRK high court sentenced four South Korean journalists to death for “insulting the dignity” of the country. Their crime was interviewing two British journalists who had written a book that “viciously slandered the reality of the DPRK”. Such pronouncements represent a demand for respect from an extremely proud political culture. Many North Koreans, certainly in the leadership, feel their country doesn’t get the acknowledgement it deserves from the international community. From their perspective, the DPRK is a small country that can: stand up against US might; build steel factories; dam up their main arterial river (they are exceedingly proud of this one); and build nuclear weapons in the face of tremendous pressure. They are obsessed with the idea of self-reliance, of a dignified Korea going its own way in a hostile world. It is a country that chose perceived dignity and self-reliance at the expense of millions of starving citizens in the 1990s. It is a country that chose to garrison itself in a way that has made it extremely resistant to external pressure or influence, but at the expense of the freedom of its citizens. At the heart of their political culture sits Kim Jong Un, the maximal leader of this garrison state. It is nearly impossible to overstate the personality cult that three generations of Kims have enjoyed. Literal songs of praise, starting in kindergarten; Weekly pledges of loyalty in mandated political study sessions; Every living room displaying pictures of Kim Il Sung and Kim Jong Il; Every academic essay beginning with a quotation by one of the three Kims. 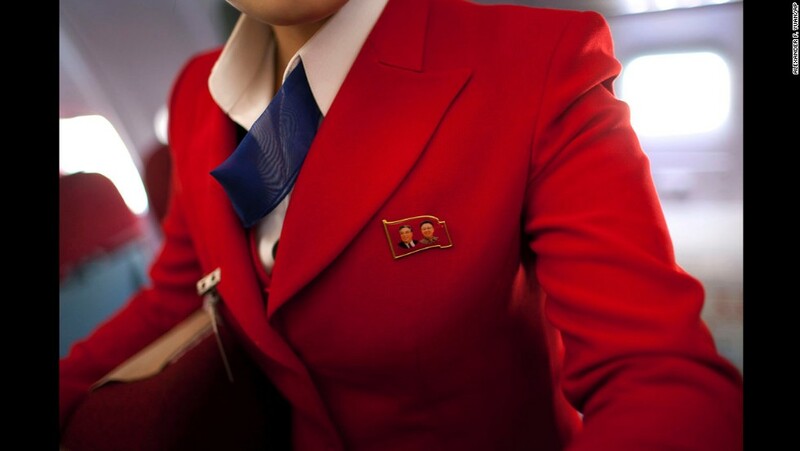 Kim Jong Un is the manifestation and guardian of everything it means to be North Korean. The seat of practical power is also the embodiment of political and social life. Thus, when Donald Trump took to personally insulting Kim Jong Un, he crossed a rhetorical line that Pyongyang will take more seriously than he could possibly imagine. Trump’s condescending “rocket man” swipes were in a sense assaults at the heart of North Korea, far graver than bombers flying off the coast in a show of force. Every North Korean—regardless of how he or she actually feels—must publicly push back against such slurs. As long as insults continue, it is difficult to imagine anyone in Pyongyang considering meaningful talks to diffuse this crisis. In a fast-moving situation, any time lost could be catastrophic. Kim Jong Un upped the ante, too. After all, he is not just a symbol but also apparently a quite prideful person. To defend his “dignity,” he slung his own insults back in the Rodong Sinmun. In doing so, Kim not only forced English speakers to look up the word “dotard,” but also made it clear to every one of his citizens that he took Trump’s insults very personally. Fortunately, he was light on prescriptions for action: statements by the Kims tend to become orthodoxy. But still, in a system where every person—certainly anyone near the top—competes to show loyalty to the leader, Kim has reduced the prospect of people close to him suggesting negotiations or compromises. Debate at the very top of North Korean politics does exist, but it comes prior to the leader’s decision. Kim has now narrowed that debate. Who could be seen to be advocating a softer line, when the dignity of their leader continues to be impugned? If a cataclysm on the Korean peninsula is to be avoided, President Trump must dial back the personal nature of his rhetoric. What worked well on the campaign trail will not yield results with Kim Jong Un. Kim will push back. He may even stumble into a war for the sake of his personal pride. Andray Abrahamian is a Visiting Fellow at the Jeju Peace Institute and has visited North Korea multiple times.